Troy, Paul, Mercedes. Copyright © 2017, FPP, LLC. All rights reserved. What a lively group! The chatter involved everything from plays to politics, movies, books, upcoming events, recent company profiles (on RTH), and common friends. What’s new: OSF’s season has begun. Lots of interesting plays on deck this season, and two people were quite well-informed on which ones are worthy. Also: Look for a company profile on OSF very soon. Gunnar, Joe, Dave, Ben, Glen, Hunter, Troy. Copyright © 2017, FPP, LLC. All rights reserved. Speaking of company profiles, just published is: Connecting Point, the local Apple Dealer—and the oldest one in the Pacific Northwest. Check it out here. Projects are moving forward as the ideas gel and the inventors pivot to address variations sparked by feedback. 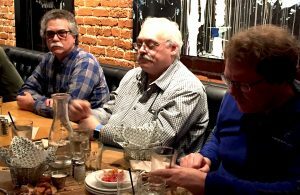 For those who wish to interact with entrepreneurs, be sure to attend the upcoming SOREDI Pub Talk at the Ashland Springs Hotel on Tuesday, March 14, from 5:30 – 7:30 p.m. They usually draw crowds of 50 people to these pub talks; it’s a great place to network. Hunter, Troy, Paul, Mercedes, Gunnar, Joe. Copyright © 2017, FPP, LLC. All rights reserved. 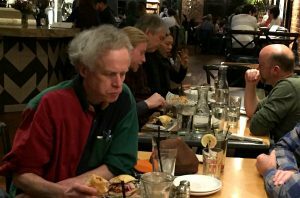 Discussions included laments that nobody actually codes from scratch anymore; programmers are merely integrators. Sadly. The upcoming Freelancing Tech Workshop on Thursday, May 11 on the SOU Campus, from 3:30 – 5:20 p.m. is generating a lot of interest; both from people who currently freelance and from those who want to know more about how to succeed as an independent consultant. Join us! Joe, Dave, Ben. Copyright © 2017, FPP, LLC. All rights reserved. The next couple of months are filled with events; check out the Rogue Tech Hub Events Calendar for details. 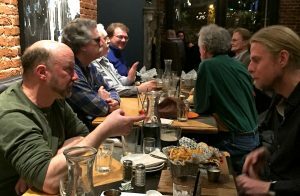 Join us next month, on Thursday, April 13 at 6:00 at The Brickroom on The Plaza in Downtown Ashland for the next CocoaHeads meeting, following the Gaming Tech Workshop on the SOU Campus, from 3:30 – 5:20 p.m.
And, be sure to attend the Tech Talk on Artificial Intelligence (A.I.) on Tuesday, April 25 on the SOU Campus, from 12:30 – 1:30 p.m. In the meantime, must read: The Fourth Transformation by Robert Scoble and Shel Israel.